There’s a strong temptation to breast out upland birds in the interest of conserving the time and tedium involved in plucking. For my money, the time is well worth it for essentially doubling the meat you’re getting out of a bird. A tip for saving both time and a little effort is simply skinning the birds. A few cuts in the right places and you can slip an entire bird out of its feathery jacket. Sure, you’re losing any skin you would have had left over after plucking – and skin can be both useful and delicious – but if you’re mostly inclined to breasting out anyway, you’ve lost nothing and gained a pair of legs to cook. I first took to skinning on a day after I’d come home with some pretty shot up birds for whom plucking simply wasn’t possible. I de-boned the carcasses to cook that day, then stored little landing gear for braising another time. 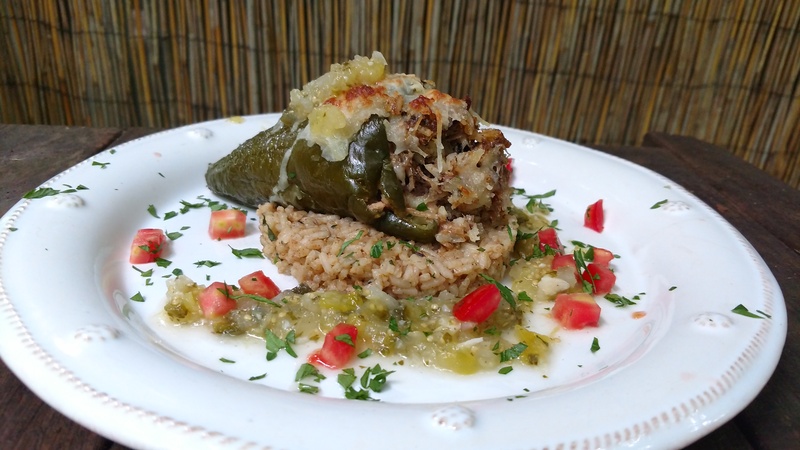 This summer my local CSA has been cranking out big, plump poblanos which, in my mind, have a singular stand-out use: Rellenos. This recipe is far from authentic, but the basics are there: It’s a simply stuffed chili. If you want, once the peppers come out of the oven you can let them cool a bit, then swaddle them in a golden-brown cloak. I left mine roasted. In a bowl, mix together the chili powder, garlic powder, onion powder, oregano, paprika, cumin, coriander, and salt. Dust each of the pieces of pheasant in the seasoning and place them in a crock pot. Dump any remaining seasoning in then pour in chicken stock. Add water as needed to cover the pieces in liquid. Cook on low for 4 hours. When the pheasant is done, remove the pieces and set aside to cool, saving the liquid from the crock pot. Cook the rice according to directions on the package but instead of water that’s called for, use the same amount of seasoned cooking liquid from the crock pot and omit any salt that’s called for. When the rice is done cooking remove from heat and stir in ½ of the cilantro. Once the pheasant has cooled enough to handle, pull the meat off the bone and shred it with a fork being careful to remove any cartilage, tendons and thin bones. Heat the olive oil in a pan over medium heat and add the onion. Cook until soft, then stir in shredded pheasant meat, 2 cups of cooked seasoned rice and 2 cups of the cheese. Heat through, then remove from heat and set aside to cool. Pre-heat your oven to 350 F.
While the meat mixture is cooking, prepare the poblanos. Using a paring knife, carefully cut around the stem at the top of each chili, pull out the stem and core and then remove any remaining seeds from the inside with a spoon. Rub the outside of each poblano with olive oil. When the pheasant rice mixture is cool enough to handle, spoon the mixture into the hollowed out poblanos fairly tightly. Lay them in a 9×13 baking pan and when they’ve all been stuffed, bake for 35 minutes. Remove them the oven, sprinkle the remaining cup of cheese over the stuffed poblanos and return to the oven to bake for 10 minutes more. To serve, spoon some rice on to the center of a plate, then spoon some of the salsa around the pile of rice. Place a pepper on top of the rice and sprinkle with fresh chopped cilantro.